Salt is essential. So is prayer. This morning, as I returned from dropping off the children at school, I was led to pray for my husband. I choose to obey. I am always praying for my husband, I pray for my husband because I can. I pray for my husband because I should. It is good for him. It is good for me. Prayer is a gift I can give to my husband, and in giving, I also receive (sounds like a deal you can’t pass up, right?) He makes me feel treasured. He loves me in a way that is indescribable; accepting; in a way that makes me want to do and be everything better. Shouldn't I show my gratitude? I’m not asking for a single thing, except his peace (not that he’s currently out of sorts or anything…) I am only being thankful. God knows what He’s planned for my beloved, so I will stay out of the way. Except to say “thank you” and do, rather than say, my love for him. (I will also tell him I love him…I always do). I am loved; and so very grateful. For me, those things are essential. And love and gratitude are two of the best things I can imagine taking into Monday and into the new week. Love and gratitude….two more things that remind me….God is good. 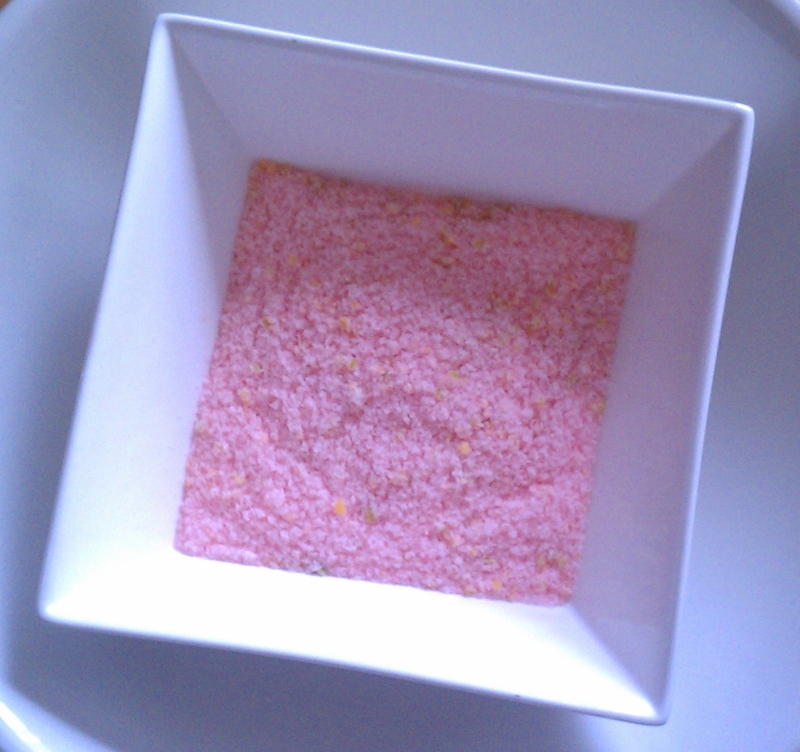 Back Story—I created this salt for Habanero Grapefruit Margaritas for my BFFs Corporate Cupid party. For the last three years, a bunch of us have gotten together at her house to make create handmade Valentines for senior citizens, all while having a very good time, However, the moment I tasted the salt, I knew it belonged on a roasted chicken, which I’ll be making tonight and sharing sometime soon. It’s simple, but beautifully flavored. I added one drop of red food coloring to match the grapefruit juice, but that’s not at all necessary. 1 Habanero pepper, seeds and ribs removed (I work with these peppers all the time, and I ALWAYS wear gloves. They are hot, hot, hot! Rough chop the pepper, and add it to the salt in a food processor. Buzz until the pepper is finely minced; the salt acts as an abrasive so this shouldn’t take more than 15-30 seconds. Add one drop of food color if you choose. Because the pepper has some moisture, spread out the salt in a shallow dish or plate to dry. "They" say that prayer changes things. I don't know who "they" are; but "they" may be on to something. I simply "agreed" to pray in my heart and I was changed. In the past, I have prayed "about" my husband but this day I am convicted, convinced, and committed to pray FOR him. Now watch God work! My favorite kind of prayer is when I'm praying not for a specific blessing ( oh please God let me catch that bus, oh please God let my child pass the algebra test, etc) but the ones that we just find on our hearts and minds at a random moment. Thanks Chelle for reminding me of that. Btw... The margaritas were AWESOME!! Can we ever be content?? What may come of prayer? ?